May 3, 2012 - Cessna Aircraft company, signed a strategic agreement with the China Aviation Industry General Aircraft Company Ltd., (CAIGA) and the Shijiazhuang Municipal Government. This agreement is a progression stemming from the strategic framework that Cessna entered into with CAIGA parent company, Aviation Industry Corporation of China (AVIC), in March 2012. 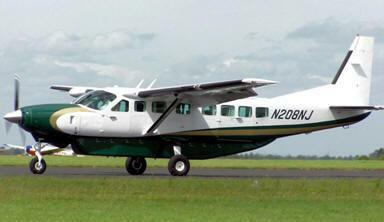 Specifically, this next step forms a cooperation framework for an eventual joint venture whose purpose will be the final assembly, sales, and customer support for the Cessna Caravan in China for the Chinese market. "It is important to understand that today's agreement is a direct result of the overarching agreement signed with AVIC in March. This agreement picks up where that announcement left off," said Mike Shih, Vice President, China Strategy and Business Development for Cessna. "Not only does this continue Cessna's involvement in the development of General Aviation in China, but it also paves the way for aircraft sales to which we would not have otherwise had access. These Cessna aircraft will be manufactured in the United States, in Kansas, and sent to Shijiazhuang, China, to undergo final assembly and then be sold in China." Cessna and CAIGA plans include locating the joint venture's operations at the CAIGA facilities in Shijiazhuang to conduct final assembly, painting, testing, interior installation, customization, flight testing and delivery of the Cessna Caravan to in-country customers. "As a subsidiary of AVIC, CAIGA has demonstrated great capabilities with general aviation production, and this made the choice of the Shijiazhuang facility a simple one," said Lannie O'Bannion, Business Leader for Caravan aircraft. "The cooperation between Cessna and CAIGA will enable us to deliver the Cessna Caravan within China for many different purposes. We have seen interest for the Caravan for use in commuter aviation fleets as well as China's growing tourist and sightseeing businesses. The versatility of the Caravan makes it a great fit for this market." Scott Ernest, Cessna president and CEO, said "We continue to be extremely pleased with the cooperative relationship between AVIC and Cessna. China's potential in general aviation is tremendous, and represents an exciting opportunity for Cessna. Since we do expect China to be one of the largest general aviation markets in ten year's time, we are excited to see that it will be Cessna aircraft that will help meet this demand in the years to come."